MARSIS ESA - Solar System Planets And Moons Section. ESA Will Risk Deploying MARSIS. Engineers at the European Space Agency will go ahead and give Mars Express the command to deploy its MARSIS radar booms during the first week of May. The agency was holding off on this decision because the manufacturer revealed a risk that the spacecraft could be damaged by a whiplash effect when the booms are deployed. Mission controllers have performed computer simulations, and they can't rule out that the spacecraft will be hit by the booms, but they're pretty sure that any damage will be minimal. 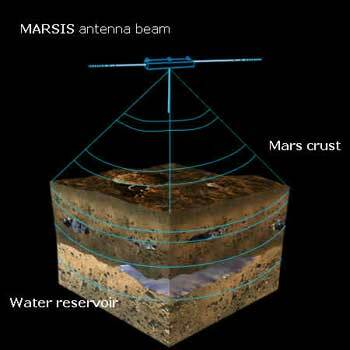 The MARSIS radar will study the Martian ionosphere and search for subsurface water. The European Space Agency has given the green light for the MARSIS radar on board its Mars Express spacecraft to be deployed during the first week of May. Assuming that this operation is successful, the radar will finally start the search for subsurface water reservoirs and studies of the Martian ionosphere. ESA's decision to deploy MARSIS follows eight months of intensive computer simulations and technical investigations on both sides of the Atlantic. These were to assess possible harmful boom configurations during deployment and to determine any effects on the spacecraft and its scientific instruments. The three radar booms of MARSIS were initially to have been deployed in April 2004, towards the end of the Mars Express instrument commissioning phase. They consist of a pair of 20-metre hollow cylinders, each 2.5 centimetres in diameter, and a 7-metre boom. No satisfactory ground test of deployment in flight conditions was possible, so that verification of the booms' performance had to rely on computer simulation. Just prior to their scheduled release, improved computer simulations carried out by the manufacturer, Astro Aerospace (California), revealed the possibility of a whiplash effect before they locked in their final outstretched positions, so that they might hit the spacecraft. Following advice from NASA’s Jet Propulsion Laboratory (JPL), which contributed the boom system to the Italian-led MARSIS radar instrument, and the Mars Express science team, ESA put an immediate hold on deployment until a complete understanding of the dynamics was obtained. JPL led a comprehensive investigation, including simulations, theoretical studies and tests on representative booms, the latter to assess potential aging of the boom material. European experts, from ESA and the former spacecraft prime contractor, Astrium SAS, France, worked closely with JPL throughout the entire investigation. An independent engineering review board, composed of ESA and industry experts, met in January to evaluate the findings and advise on 'if and when’ to proceed with deployment. The ESA review board, at its final meeting on 25 January, recommended deployment of the MARSIS booms. The rationale for the decision was based on the results of the analyses, which showed the possible impact scenarios, the amount of energy involved, the nature of the materials, and the physical conditions in space. The board concluded that the risk of an impact on the spacecraft could not be ruled out, but that the impact energy would be low and the probability of a severe failure was very small. One credible failure case is that an antenna boom could become blocked during deployment, either by itself or by the spacecraft. Although means are available to unblock a deployment, in the worst case MARSIS would have to be considered partially or completely lost. However, the analyses have shown that the Mars Express control systems would be able to cope with such a configuration and minimise the consequences for the other scientific instruments. The ESA board recommended planning the deployment for the week beginning 2 May. However, should the remaining preparations proceed faster than planned, it might be feasible to start deployment during the week beginning 25 April. An early deployment is scientifically desirable, as the evolution of the Mars Express orbit will allow radar measurements of the most interesting scientific regions on Mars to start in May 2005. If, as expected, the deployment is successful, MARSIS will probe the secrets of Mars’s subsurface at least until 30 November 2005, the nominal end date of Mars Express operations, and beyond if the mission is further extended.